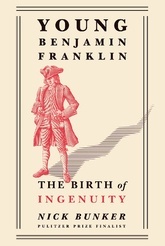 Benjamin Franklin has always seemed the embodiment of American ingenuity and self-reliance. But in his youth, he was a conflicted young man who struggled to balance virtue against his own wayward emotions and growing ambition. Taking Franklin to the age of forty-one, when he made his first electrical discoveries, Nick Bunker reveals the sources of his passion for learning. No other author has delved as deeply into Franklin’s family roots in Britain. By showing how his upwardly mobile ancestors passed on their own desire for knowledge, he upends the accepted image of Franklin as the ultimate self-made man. Young Benjamin Franklin is a compelling tale of science, politics, war—and the evolution of a flawed but brilliant figure.